The joint major in Italian and European Studies acknowledges the cultural, political and strategic importance of Italy within the community of European nations. 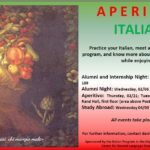 It requires 42 hours of course work, and a semester of study abroad in Italy is recommended. Prospective majors should consult with the Director of Undergraduate Studies in Italian and with the Director or Associate Director of the Max Kade Center for European and German Studies.